Wonderful news! 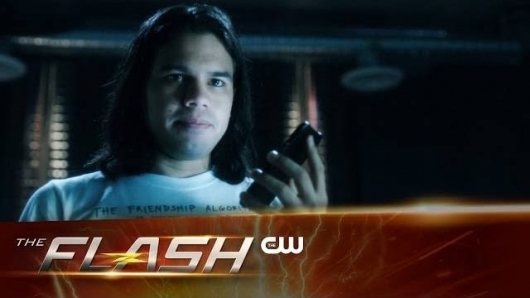 The Flash now has little Cisco (Carlos Valdes) webisodes sponsored by AT&T! These little tidbits, named “Chronicles of Cisco” show (so far) an evening in the life of everyone’s favorite Central City citizen (okay my favorite, but I know I’m not alone). Check out the webisode below. “Break yo’self fool!” Cisco is always good for the pop culture references, having the quickest wit in town. He’s fixing the Flash’s suit, after shooting it up for testing, but he cannot drown out the pull of Zoom’s helmet. He throws something over it and falls asleep – never a good thing when you live in a world of metahumans, time wraiths, and evil speedsters. The alarm on his phone goes off… a metahuman alert! There is one in S.T.A.R. Labs. Fade to black. What do you think? I think it’s just beeping for Cisco or Barry (Grant Gustin). I’m really happy I get to look forward to a Cisco-centric clip now. When Vikings did it with the Athelstan Journals, it made all of us fans want even more, and I’m sure it will be the same with these videos. I wonder how they will connect the TV episodes with the clips. They did manage to tie-in Barry and Oliver to the animated Vixen show when she visited Star City, so it will be interesting and probably adorable when they do it here. And now that Zoom kidnapped Caitlin (Danielle Panabaker) to Earth-2, Cisco has even more to worry about. Zoom stole his best friend. Maybe that is what Cisco will work on next. A late night at S.T.A.R. Labs turns dangerous in the premiere episode of Chronicles of Cisco, presented by AT&T.